Project Amigo is an outstanding program that the Rotary Club of Santa Rosa has been supporting for many years. Education and literacy are powerful keys to enabling a brighter future for the world’s children, who in turn benefit the nations they live in. For nearly three decades, Project Amigo has helped rural children in Mexico continue their formal schooling up to and including college level. In existence since 1984, and formally as a U.S. 501-2-3 non-profit charity since 1996, Project Amigo provides educational scholarships, material support, enrichment activities and preventive and remedial health care to disadvantaged children and youth in Colima state. Volunteer Work Weeks based at our head-quarters in the beautiful hillside village of Cofradía de Suchitlán allow volunteers from developed countries to engage in humanitarian service and become both friends and sponsors of Mexican children and youth seeking the many advantages of education. Presenting will be the Chairman of Project Amigo’s Board of Directors, Sarah Ferris. Coke and Cindy Newell. Directors of Project Amigo are helping with staffing changes in Cofradia and will remain in Mexico this spring. President Sarah Ferris retired from Chevron Oil after a 30-year career. She started as a chemist in the Perth Amboy, New Jersey refinery and held jobs of increasing responsibility, traveling extensively and living abroad. She retired as Vice President of Marketing for Fuel and Marine Marketing, a division of Chevron. While with Chevron, she participated in Junior Achievement and in local school activities. She joined the Project Amigo Board in 2006 and became President in 2010. She sees education as a priority for overcoming poverty, and serving on Project Amigo’s Board gives her the opportunity to be part of an organization dedicated to making a difference through education. 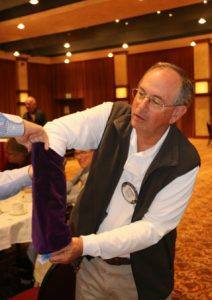 President Mark opened the meeting with a loud “CLANG” of the Rotary bell. Rick Allen was a winner today! Eileen Carlisle reported that all was sunny plus Shannon McConnell had her baby on May 8th, a boy – named Grayson. 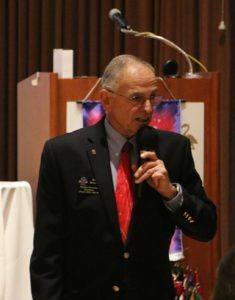 Bob Rogers, a Rotarian from the Sebastopol Club, gave a history of Rotary’s involvement with the campaign to eradicate Polio from the world. Polio, as you know, is a devastating virus that most often attacks the young and dramatically changes lives. When Rotary started its fight against polio, there were 350,000 children per year contracting the virus. Today, year to date, there are only 33 new cases reported worldwide. After this presentation, Bob asked the audience who would like to step up and further help this effort to completely eradicate polio in the world. A rough count showed 27 club members raising their hands & volunteering from $25 to $100 toward this worthy project, with over $2,000 donated.